Do Military Enlistees Actually “Know What They Are Getting into”? 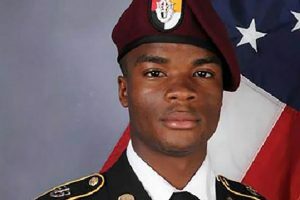 Following the death of Sergeant La David T. Johnson in Niger, Johnson’s family reported that President Donald Trump told them Johnson “knew what he signed up for.” Trump Chief of Staff John Kelly, in attempting to explain Trump’s remark also stated Johnson “knew what he was getting himself into.” While this has received a fair amount of attention in terms of the appropriateness of such remarks, few have examined whether or not military enlistees like Johnson do know what they are signing up for. Elder argues that between economic pressures, racial prejudices, lack of educational opportunities and deceit in the military recruitment process faced by many enlistees, they frequently don’t actually know what they are signing up for. He said today: “Johnson graduated from Miami Carol City Senior High School in 2010. The school is 99 percent minority with 86 percent identified as economically disadvantaged. Just 14 percent of the students are proficient in math and 23 percent are proficient in English. The school’s college readiness index is a 7.5 on a scale of 0 to 100. Trayvon Martin also attended Miami Carol. “Miami Gardens, where La David lived, is a city of 110,000 that is 98 percent African-American and Hispanic. Over half of the city’s population were stopped by police between 2008 and 2013. Miami Gardens is one of the most crime-ridden cities in America. The murder rate is three times the national average. “La David’s daughter was born in 2011, the year after he graduated from high school. He worked in the produce department at the local WalMart. In 2014, he married Myeshia Manual and enlisted in the Army as a wheeled vehicle mechanic. He wanted to take care of his wife and child. “1. Your chances of being sent to a combat zone are slim. “2. It’s fairly easy to get out if you don’t like it. “3. You’ll get the job on your enlistment contract. “4. If you refuse to ship out to basic training you will go to jail. “5. Once you complete your enlistment you can get out and won’t be called back again. “6. You’ll get the location you want. “7. You don’t have to disclose your mental health issues.